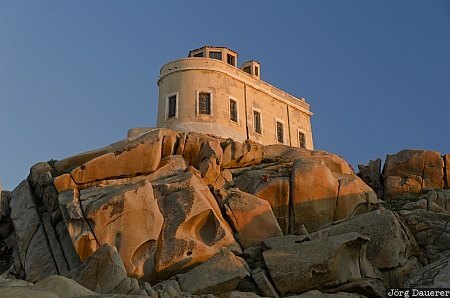 The old lighthouse (Faro Vecchio) of Capo Testa above the typical granite rocks in front of a blue sky illuminated by warm evening light. Capo Testa is in northern Sardinia (Sardegna), an island in the Mediterranean Sea that is part of Italy. This photo was taken in the evening of a sunny day in October of 2011. This photo was taken with a digital camera.